Metrical photogrammetry is used to determine distances, elevations, areas, volumes, cross sections, and to compile photographic maps from the measurement made on photographs. Aerial as well as terrestrial photos are used for this purpose. Aerial photos are photos taken from a camera in aircraft or another elevated level, while, terrestrial photos are taken from a camera mounted on the ground. Interpretative photogrammetry is used to identify shapes, sizes, colors and textures of images. Interpretative photogrammetry is also known as accurate interpretation. Aerial photos are used for interpretative photogrammetry. The recent development of other sensing and imaging devices such as multi-spectral scanners, thermal scanners, radiometers and side-looking airborne radar are helpful tools in interpretation. These instruments sense energy in wavelengths beyond those which the human eye can see or ordinary photographic film can record. They are often carried in aircraft as remote as satellites. A new term, remote sensing, is now generally applied to the interpretative area of photogrammetry. Photogrammetry has many applications in surveying and engineering. It is used for mapping and control surveying of land as well as waterways. It is also used in geology, archaeology, forestry, agriculture, conservation, planning, military intelligence, traffic management and accident investigation. Remote sensing is defined as the study of data obtained from a remote observation point. It is the extraction of information about the earth and our environment from imagery obtained by various sensors carried in aircraft and satellites. By mean of satellite imagery, we can monitor our entire planet regularly. 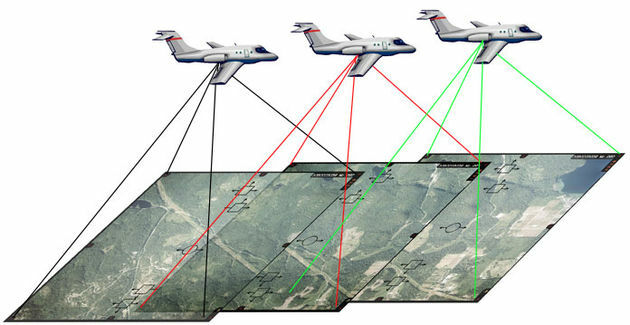 Remote sensing imaging system operates on the same phenomenon as human eyes operate, but it can extract information on a much broader range. All other hues are combinations of primary colors. To the human eye, an object appears a certain color because it reflects the energy of wavelengths producing that color. If an object reflects all energy in the visible range, it will appear white, and if it absorbs all energy, it will be black. If an object absorbs all green and red energy but reflects blue, that object will appear as blue. Remote sensing technology has been applied to locate forest fires, detect diseased crops and trees, study wildlife, monitor flood and flood damages, analyze population growth and distribution, determine location and extents of oil spills, monitor water quality and detect the presence of pollutants, and accomplish numerous other tasks over vast areas for the benefits of the mankind. The first remote satellite was launched on April 1, 1960, named TIROS-1. It served for forecasting weather and other meteorological effects. The cameras on this satellite transmit the image to the receiving station on earth. The second revolution came into being with the deployment of Landsat satellites on July 23, 1972. Several generations of Landsat satellites with their Multi-spectral Scanners (MSS) have been providing continuous coverage of the Earth for almost 30 years. Currently, we have Landsat 7, and Landsat 8 is in operation. The main component on Landsat 7 was the Enhanced Thematic Mapper Plus (ETM+). Landsat 8 has two sensors with its payload, the Operational Land Imager (OLI) and the Thermal InfraRed Sensor (TIRS). On February 22, 1986, a French agency CNES (Centre National d'études spatial) launch a commercial satellite named SPOT (Satellite Pour l'Observation de la Terre- Satellite for observation of Earth). It has been designed to improve the knowledge and management of the Earth by exploring the Earth's resources, detecting and forecasting phenomena involving climatology and oceanography, and monitoring human activities and natural phenomena. The SPOT system includes a series of satellites and ground control resources for satellite control and programming, image production, and distribution. The latest series under working are SPOT-6 and SPOT-7 launch in 2012 and 2014 respectively. These satellites have the capacity to capture 3 million square kilometer area in a day. Radarsat-1; the first commercial earth observatory satellite; was launch on November 4, 1995. It was operated by Canadian Space Agency (CSA) with the cooperation of other government and private sector agencies. Radarsat-1 is unique from other satellites as it works on active remote sensing system that transmits and receives microwave radiation. Radarsat-1 can work in the absence of sunlight. Radarsat-1 has an image resolution of about 8 to 100 meters. It is used for geologic and hydraulic mapping, disaster management, defense supervision and resource detection. MLA (Modern Language Association) "Photogrammetry and Remote Sensing." ScienceAid, scienceaid.net/Photogrammetry_and_Remote_Sensing Accessed 20 Apr 2019. Chicago / Turabian ScienceAid.net. "Photogrammetry and Remote Sensing." Accessed Apr 20, 2019. https://scienceaid.net/Photogrammetry_and_Remote_Sensing.